Do you have a favourite episode of Steptoe and Son ? Could it be Full House, where Harold tries to play poker ? Well now you can vote for your personal best. 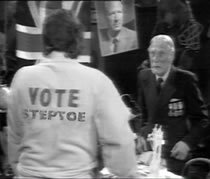 Below is a list of every Steptoe episode and the number of votes already cast for it. You have a chance to cast your vote by selecting the radio button next to your preferred episode and clicking the button at the bottom of the page. Don't worry if you change you mind at a later date, you can vote once a week if you wish. Remember to come back on a regular basis and see what other Steptoe fans think.